I admit it. It’s true I haven’t posted an update on my layouts for a while and since the last report a lot has changed. So here’s what’s gone since then and the techniques I’ve used for track bedding and wiring along the way. Firstly, there’s been a big change in my layout plans. The original plan was to build a layout based on St Blazey in Cornwall. Later, I also thought it would be fun to create a much smaller layout based on the sidings at Guildford. St Blazey is still very much on the cards but – for various reasons – I’ve had to put this on a back burner for a while. At the same time, the Guildford layout was only intended as a playground test environment and with the delays to my main layout I wanted something more complex than just a basic sidings to keep me out of trouble. So I after a bit of imagination and playing with AnyRail a redesigned the track plan for 2x3ft board (prepared for the Guildford sidings) is starting to emerge. The current arrangement for new layout (seem roughly below) is themed around a hilly mining area and features an oval loop, spur, Inglenook type goods yard inside the oval and an industry area to one end hopefully with a further three sidings. The hills will be around the edge – notably top right – and centre and will hint at the geology necessary for tin ore extraction with the mines scattered around them. With mine work there will also naturally be rocks extracted so I hope to feature a wagon loading area somewhere on the left. The hills will also feature a tunnel, trees and my secret fun feature. The yards on the left – the exact form of which I’m still undecided about – providing a processing and loading area. 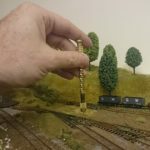 My altered layout plan – mining focused; the track/sidings on the left will change. The hills will allow for trees and my fun element. It’s not very big – in every sense – but has enough to keep me occupied until I can start on St Blazey. The spur gives me potential scope to expand off to another board easily which I’ll probably do in future but in the meantime will serve as a location for an engine shed with water and coaling facilities. As mentioned, the arrangement on the left – the industry zone – will change. The track plan for it here is purely place holder. I hope to design in a loop to allow the loco to switch ends – parking the wagons, decouple and run around them to pick up from the other end – but we’ll see. With the track plan sorted, I could finally get to work on track laying. The layout from the track plan was marked up on the baseboard in pencil and a cork track underlay for the main loop and lower spur and for part of the internal sidings was put down along it. As said, the arrangement on the left is not decided yet and I’m not happy with the internal sidings yet so rather than waste cork I’ve left this area for another day. I used 2.5mil thick cork sheets – available in rolls of 36″ (here via Amazon) – with a PVA glue (or Copydex if noise is a concern) to attach it to the baseboard. Some people prefer heavier cork sheeting as they find the glue can make it go brittle and reduce the sound insulation provided but I’ve never had this problem as long as the PVA is watered down. I also find 2.5 millimeter thickness raises the track in proportion to the embankments of real track. Prior to laying the track, I drilled a 4mil diameter holes through the cork and baseboard for power feeds but more on this in a minute. After this, I glued the track onto the cork (apart from the sections where I planned to apply power) with No More Nails glue, available via most hardware stores or Amazon if needed. 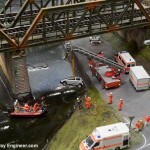 I covered glue types for model railways before if you’re interested. 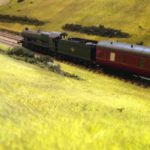 I find having the electrics that make model railways work visible really distracting and ruins the authenticism of the layout and so hide it if at all possible. For the track power connection, I used the technique detailed in How To Avoid The Two Ugly Sisters Of Track Soldering Hell which avoids globules on the sides of the rails. To do this I drilled a hole through the baseboard between the track rails, pushed the dropper wires through and then soldered it to the underside of the rail joiners. The wire was pulled back and the track then positioned, connected to the joiners and glued down before the wire was finally pulled tight from underneath where it connects to the Bus and onto the terminal blocks. Unlike the rest of the track, these sections where power is attached are glued with PVA so in future, they can be easily pried up if electrical problems emerge. The end result can be seen below. 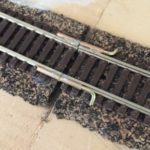 Once a sleeper is inserted, the rail weathered and ballasted you won’t know it’s there – just as it should be. Wires are soldered to the underside of the track joiners and then pulled a hole through in the baseboard between the tracks to minimise wiring visibility. 2.5mil cork sheet is used for track underlay. A similar technique will be used for remote control of the points, etc. Peco PL-10E point motors will be mounted under the board effectively rendering them and the wires to the control switches (Peco PC-26) and other electrics (decouplers, etc) invisible and achieving my goal of hiding the electrics and devices used to make the layout work. I’ve also started on the hills (shown in Green in the track plan above) with the core hill shape constructed from polystyrene sheets and held in place with PVA. Normally, I wouldn’t start on scenery works until all the track is down but I’m thinking of running power to a mine shaft on the hill for lighting and again want to hide the wiring so needed to position it for drill holes and wiring. And that’s where my layout has got to so far. Next up will be the remainder of the track, point motors, and ballasting or maybe refinement of the track plan on the left. 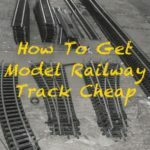 As someone returning to model railways after many years, i find the biv issue i have is the wiring.l find most of the experts that provide tips on how to wire track jump straight from wiring one oval to multi tracks with busses and points. This misses out the vital bit on how to take to tracks which have their own power to using points to join up and how best to wire these along with adding sidings. Do you have or know of somewhere to get he info on basic wiring step by step for complete beginners. Have you been able to write anything on this and if so, where can i get hold of it. sorry to be a pest, but all the books and mags just seem to rush off into multi tracks\points and DCC. my basic layout is two ovals with points connecting them. where I start to find issues is if I add extra points into sidings it is adding power to these or trying to use main track power only. But if you’re switching and isolating then this the related article is probably more useful. Of course, I could be misunderstanding you complete 🙂 Let me know if so, happy to help further.